Matcha is a high quality green tea in which the whole leaves are crushed to become a fine-ground powder. Traditionally, it’s whisked in a bowl with hot water to become a rich, frothy beverage (my favorite way to enjoy it!) Matcha is special because it’s the only form of green tea in which the entire leaf is consumed (as opposed to brewed tea bags which you steep then throw out the bag). Ingesting the entire leaf makes it an antioxidant powerhouse, providing amazing health benefits that far exceed other teas or beverages. During this shading, the plant grows more theanine. (So cool!) Theanine, which is an amino acid, helps induce a state of wakeful calmness. It works its effect in our body more gradually across a longer span of hours, giving that longer-lasting energy without the jitters or crash typical from coffee. Studies also show theanine is effective at reducing stress and promoting relaxation (without sedation) while improving attention/focus. I’ve definitely noticed all these effects in my own experience – happy and relaxed, but focused and alert throughout the day… amazing! Long ago in ancient civilizations, tea began as a medicine. Only later did it turn into the casual daytime beverage that we enjoy today. But modern studies continually reveal the huge range of health benefits of matcha, and they’re pretty impressive. 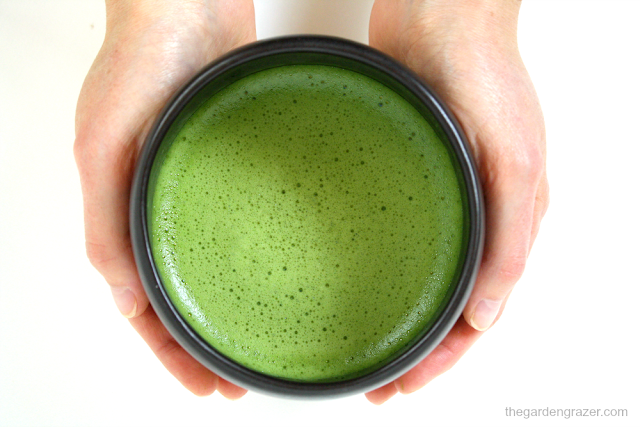 One study states a single cup of matcha contains 137 times more antioxidants than a cup of brewed tea bag. 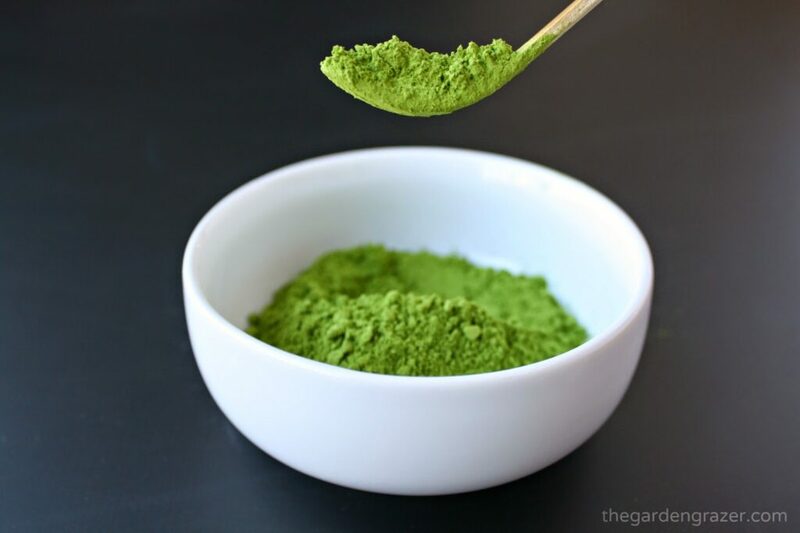 What’s uniquely special is that matcha contains a certain kind of antioxidant called catechins (of all antioxidants, catechins are the most potent and beneficial). Matcha is especially high in one specific catechin, called EGCG, which is recognized for its cancer fighting properties. 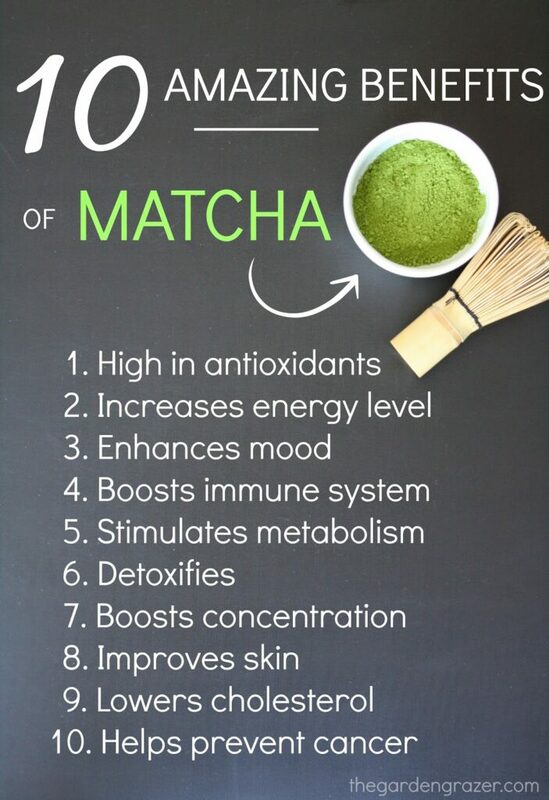 To learn more about other health benefits, check the graphic below and Encha’s “Science of Matcha” Health Benefits page. 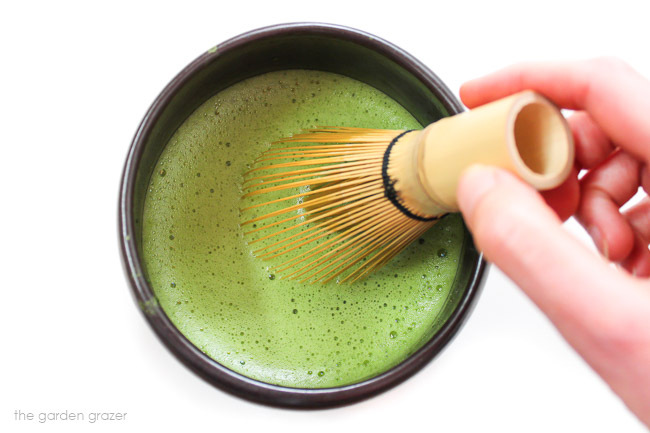 Preparing ceremonial matcha is quick and easy – just 5 minutes! 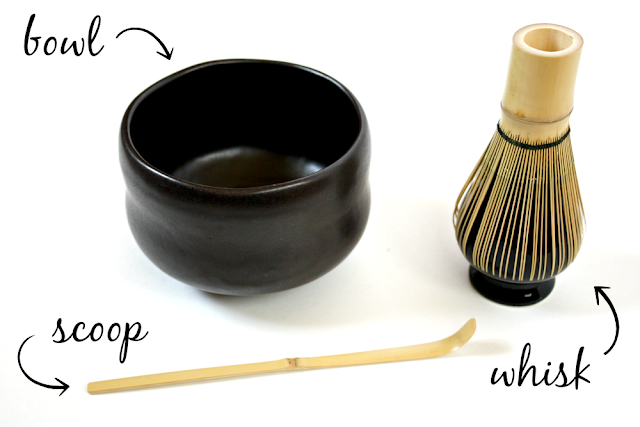 You’ll need three simple tools shown below: a bowl, bamboo whisk, and measuring scoop (or teaspoon). Since you’ll whisk vigorously to achieve the beautiful froth, it’s best to use a wide and deep enough bowl (if you don’t have a matcha bowl, a soup bowl works great). 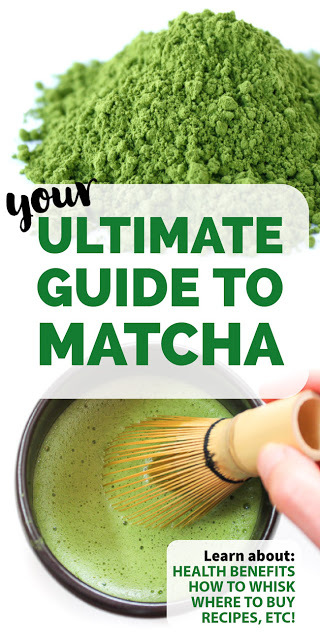 Whisking pure matcha is my favorite way to enjoy, but I also love lattes, smoothies, and iced matcha (see recipes below for a few ideas). Some people even cook and bake with it. One of the great things about matcha is it’s versatility! You can enjoy it pure, creamy, or sweet – it’s all about finding the best way it fits into your own daily routine. Matcha is truly unlike anything I’ve ever experienced. It gives me laser-sharp focus and a happy, positive energy. (Zenergy!) My mind is so much more relaxed – dissolving negative energy and leaving my thoughts clear for positivity and production. Before matcha, I didn’t really drink coffee because it didn’t settle well and almost always caused a crash. I’ve been a long-time fan of regular green and black tea but it doesn’t provide the unique zenergy like matcha. I drink matcha daily in the mornings, and very once in a while enjoy a half serving the early afternoon if I’m needing a boost. It significantly helps with that late day slump, reducing my stress and giving plenty of happy long-lasting energy while I make dinner, clean up, chase a toddler, etc. 😉 I also noticed after a couple months of daily matcha that my skin tone improved and there’s been a general increase in my immunity. I never thought I’d be able to pry the coffee from my husband’s hands long enough for him to try matcha. But he agreed to do a week-long experiment with me to test the effects. Surprising to us both, he loved it! 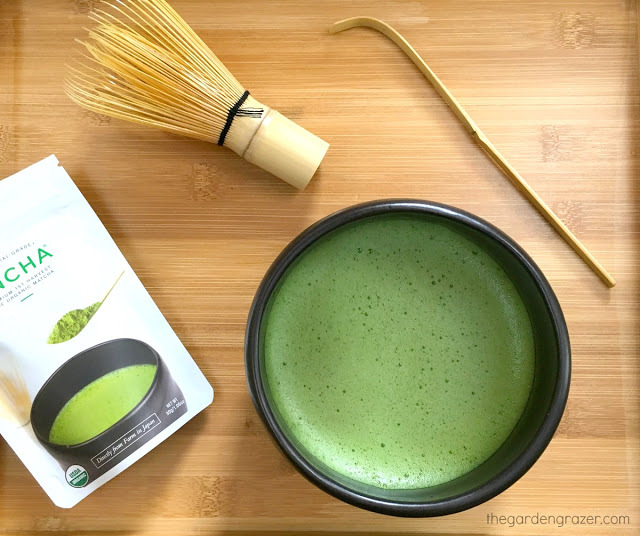 Now he often whisks matcha in the morning before work, and sometimes again after lunch to give that calm, steady alertness throughout the day. One morning he drank matcha before studying, and said he couldn’t remember the last time he studied that well. (How cool is that?!) He loves how “clean” matcha feels over coffee. Where do you buy the best matcha? 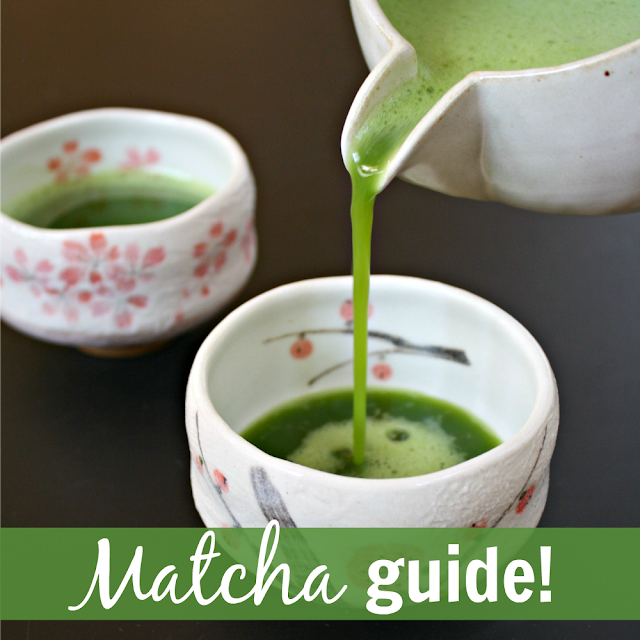 Matcha is so versatile – here are a few recipes to get you started! 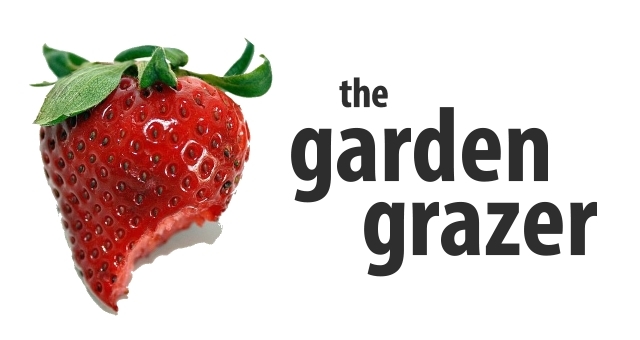 Come join The Garden Grazer on Instagram 🍓 and share your matcha pics! I LOVE seeing them! Thanks! 🙂 Are you a matcha drinker? Hi! I just try matcha for the first time and I love the way it boost my energy and awareness without the negative effect of the coffee. Thank you for sharing your passion. Love your site! Hooray! So wonderful to hear you're enjoying matcha! Did you order from Encha? Thanks so much for your kind words about the site – very appreciated 🙂 Have a lovely week!! Hi! No, I live in Quebec, Canada so I bought it closer to home at Davidstea.com. I hope it is the same quality. Have a great week-end! I definitely want to try matcha! Just wondering, do you buy the ceremonial grade or the culinary grade? Thank you! Awesome! I buy both, but ceremonial grade is the one I use in my daily routine for hot, whisked matcha 🙂 Once in a while when I make smoothies, I use the culinary grade. And if you're into lattes, they have a latte grade as well! It all depends on your daily routine. Would love to hear if you try it – keep me updated!! I only drink plain black coffee, so I think the ceremonial grade would be better for my needs. Encha is sold out right now, so I'm trying to decide if I should wait it out or try a different brand. I am super excited to try it. Anything that will help with energy, both physically and mentally, is worth a try in my book! Thank you for sharing your experience! Yay, so fun to hear how excited you are to try it!! I just talked to Encha, and they said it should be back in stock later this week (or Monday at the latest). If you can wait it out, I highly recommend theirs!! I am not a coffee drinker. I am an iced green tea drinker. What does Matcha taste like? Could I drink it iced if I don't like it hot? Hi Kim! I looove the taste of matcha – it's smooth, slightly sweet, and tastes like a very pure green tea 🙂 Delicious!! It's wonderful as an iced drink. You can prepare it two ways: either whisk it hot and serve over ice, or cold brew it by shaking the matcha with cold water and add ice. Let me know if you give it a try!! Thanks… I will try it. Hey Sandy! So wonderful to hear from you and I'm so glad you're excited about matcha!! Encha does ship worldwide ($15 is standard shipping). Just visit encha.life to order! Let me know if you have any other questions – can't wait to hear what you think! hi thanks for your article, I'm wondering since I already take a vitamin supplement that contain B-6 and B-12, for energy and mental focus , would this Matcha really benefit me or would it be too much ?? I have been a diet coke addict for 30 years. The only time I've been able to stop was when I was pregnant (and the first thing I asked for after delivery was a diet coke!) I drink 4 -6 a day. I know. My daughter has been begging me to stop drinking it ever since she learned in school that it was bad for you. I always tell her I'll try….. but I can never make it more than a day without it. She tells me "mom you say you love me but if you loved me you'd stop because you want to be healthy for me" – this stabs me right in the heart! So I stumbled across your page in search of a cilantro dressing recipe and found your matcha post and figured I'd order some and maybe that would help me kick the DC habit. I am happy to report that today I am TEN DAYS without it. I can't believe how great I feel and how I don't even miss the other stuff! More importantly, my daughter is SO proud of me. Thanks for turning me onto such a great product! Amazing – absolutely amazing! What an inspiring story, thanks so much for taking the time to share. What a sweet daughter you have 🙂 Congrats on kicking your diet coke habit, and making the successful switch to matcha! Yay!!!! Matcha can be such a life changer in so many incredible ways. I have a couple questions for you! Can you email me at [email protected] so we can chat? Thanks, have a great week!!! We have yet to try matcha tea, although we have been wanting to for some time now! I think we are going to have to go out today and find some 🙂 I think we will have to try adding it to our Super Green Smoothie http://thewellnesssoldier.com/super-green-smoothie/ ! Hope you enjoy! The smoothie looks great – yum! I highly recommend Encha organic matcha. Not all matchas are created equal and Encha is the best I've found. Everyone I share it with loves it!! Hi! 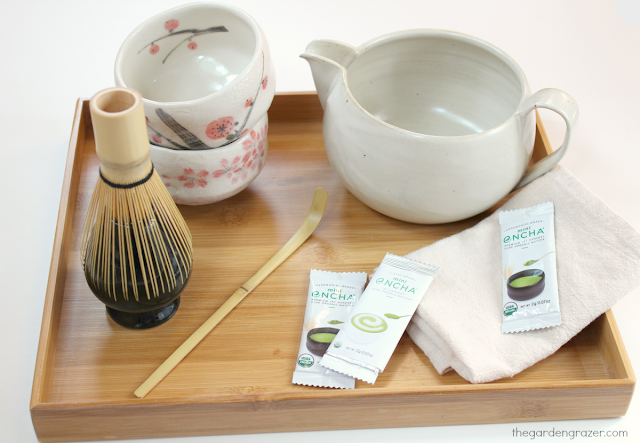 I just had my first cup of Matcha tea using Encha ceremonial grade matcha. I done it in a traditional way using a whisk. I love the feeling after drinking the matcha, but does matcha has some hint of bitterness on its taste? Because based on my research before I buy matcha, there is a taste of sweetness in matcha. Hi Edwin! Very excited to hear you enjoyed your first cup of Encha organic matcha!! Great to hear you experienced the calm energy, isn't it wonderful? Many matchas have quite a bitter taste, but Encha is smooth and delicate. Remember to use water that's not boiling (around 160-170 degrees if you have a kitchen thermometer to double check). It should taste pleasantly vegetal/grassy but Encha ceremonial shouldn't really be bitter 🙂 Some people do add sweetener to theirs if needed, but I prefer mine just tea and water. Would love to hear how your whisking went! could you tell me why Matcha gives you energy? I have stopped drinking anything caffeinated and do not want to get back into another addiction ;( I drink decaffeinated black and green teas and decaffeinated coffee. I would love to try Matcha if it does not work like the usual energy drinks though. 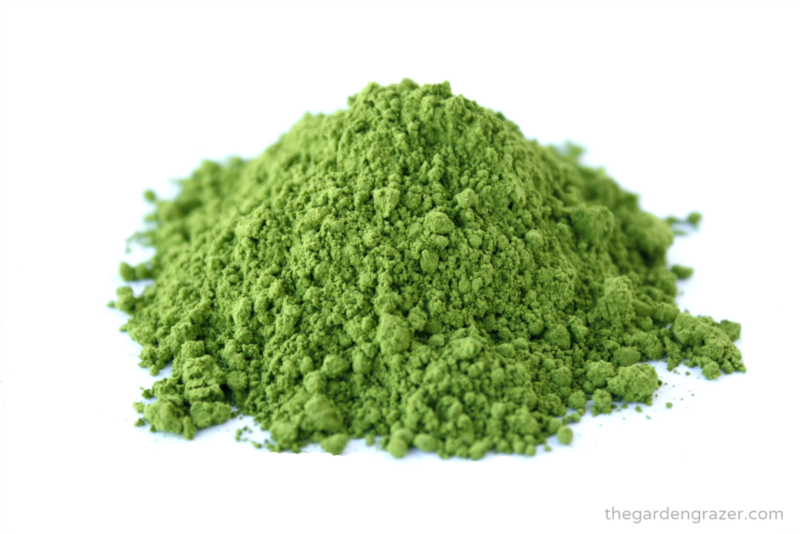 Hi just wondering is Matcha the same as Maca I have some Maca and it is a powder and is light beige in color…..are they the same thing? Hi! Nope, matcha and maca are two very different things 🙂 Matcha is the green tea mentioned above, and maca is a root from the radish family, most often sold in powder form. (Here's an article on maca: http://www.vegkitchen.com/nutrition/7-top-health-benefits-of-maca/) I have yet to try it – thanks for the reminder! I also love your site and your blog. It's very informative. I want to try Matcha. My question is whether a bamboo whisks is really necessary. Could I use a blender instead? Many thanks for sharing your ideas, recipes and story with us! However if you're looking to prepare it in the traditional way with hot water, the whisk is really great to have (plus it's fun) 😉 I'd love to hear if you give it a try and which methods you choose! It's such a versatile ingredient! I have yet to try drinking matcha, we are using it for our home made ice cream. They are delicious. That sounds awesome! I've never tried matcha ice cream but will have to! I wanted to thank you for this post. After reading your blog, I decided to purchase a set from Encha. I just received my Encha set today and made my first Matcha latte. It was delicious! Nothing at all like the ones I've purchased at cafes. I used Encha ceremonial grade, whisked and then added heated and frothed almond milk. So good and no bitterness nor sweetener needed. I have a sample of the latte grade to try, so I'll see how that goes. I'm excited to wean off coffee. I love it but it doesn't feel good these days. I definitely feel alert and clear, I guess I'll see what happens as I continue to incorporate Matcha into my life. Again, many thanks! First timer for match a tea this morning. Seems like I got a slight headache after drinking it. I normally do my morning walk now, but I must wait for it to let up. I did eat some cereal in hopes it helps. I didn't read whether or not you drink the tea before or after breakfast or even during. What do you think? Hi! Great question (and sorry for the delay in my response!) I heard of someone getting a slight upset stomach once but they drank it really fast first thing in the morning on an empty stomach. I haven't heard of anyone getting a headache though. I always drink mine after I have a bit of breakfast, so I've never run into any issues. Have you tried it again since then? How are you enjoying it? Enjoying it to the max. Got my oldest sister hooked as well. Took some to her house one morning and made us both a cup,and she enjoyed it so much, she order some from online. I drink with my breakfast or after breakfast. No more headaches. I think drinking it on an empty stomach is what gave me the headache. Thank you. Aww hi!! Thanks for your very kind words. So excited to hear your enthusiasm for the recipes 🙂 Hope you enjoy them, and wishing you the happiest new year! Thank you for sharing this, Kaitlin. Until now I had never heard of Matcha, but am going to give it a try. A mid afternoon energy boost sounds very nice to me. 🙂 I ordered it from your recommended company for best effect. I'll share some with my coffee lover husband and see what he thinks. Thanks again – I love your site! Hi again Skye! 🙂 YAY I'm so excited to hear you're going to try it! You won't be disappointed with the quality of Encha, it's amazing. Would love to hear what you and your husband think of it!! Have a great weekend! I'm an everyday coffee drinker (guilty of having 3-4 cups) with all the fancy machines to drink my coffee. I decided to try Matcha. Usually by the 2nd day I have the bad headache if I miss my cup of coffee. But I have to say- not this time. I'm on my third day. I also pulled my husband in on this new adventure. We are loving it so far. POSITIVE VIBES! Thank you for sharing. Best Wishes! Hi Tina!! Totally awesome 😀 Thanks for sharing your story – SO fun to hear you and your husband are exploring it together! <3 How do you guys like to drink it? Pure matcha tea, lattes, etc? Did you order from Encha or a different company? Keep enjoying and have a great weekend!! Hello Kaitlin. We are still going strong and LOVING it. I have not touched a cup of coffee in 1 week now. But I am guilty of smelling it. We both drink with fruit tea's. I'm very proud of my husband because he WAS NOT a Tea drinker. He hated it. Till we went through many taste testing- this was NOT fun on his part. But very funny for me. 😉 We mix it with sugar rocks to sweeten the taste- since matcha has a grassy flavor. This helps it go down a little easier. My next order I'll try ordering it from Encha to see how it is. But we tried it at our local Teavana store. Hope your weekend was good. I'm trying to pull my parents in on this adventure now. Haha. As I've been reading all the benefits Matcha has. I also love that you're going to introduce it to your parents! I did that too 🙂 My dad's not a fan but my mom is a daily Encha matcha drinker now (she loves simple almond milk lattes). It's such a fun thing to share with others! Keep enjoying and let me know if you have any questions. Would love to hear what you think of Encha when you order and how it compares to the matcha you're trying now! Have a beautiful (matcha-filled!) weekend! Wow I guess I need to try this! Focused energy would be a lovely thing! I haven't! Is theirs organic? From Jack McAdam: Here is a wonderful drink that I enjoy in the morning. I teaspoon of Matcha tea with a frozen cube of wheat grass, then stir in 3 tablespoons of the hot water and whisk. Then add a teaspoon of bee pollen and a teaspoon of organic honey, add the remainder of the hot water to make a full cup and give it a final whisk. It's tasty and delicious. Hi Jack! Great to hear from you – thanks for taking the time to write. And WOW that sounds like an incredible morning power drink!! What a way to start the day 😀 I never thought to mix matcha & wheatgrass, but I love that. I used to grow my own wheatgrass for juicing – is that what you do and then freeze it? Thanks so much for sharing, have a great week!